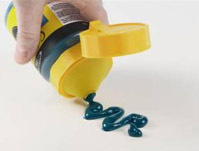 Some years ago Winsor & Newton completely re-designed the Galeria cap, and improved the Galeria 250ml and 500ml pots. Stackable, flip-top cap: The cap has a flat top so you can stack the pots in your studio, making them more space efficient. They are also more economical as when you are reaching the end of your colour you can store the pots on their caps upside down so the colour drains on the cap. Nozzle: The cap has a flip top, so once you open the lid, the nozzle is revealed - this allows precise and measured application, either to your palette or directly to your painting surface depending on your style. Wider necked pots: The necks of the 250ml and 500ml pots have been made wider so that you can get at the colour if you want to use a palette knife for example. The wide necks also make it much easier to access every last drop of colour when you reach the end of the pot. Steeper shouldered pots: The angle size of the shoulder of both pots has been reduced. This means that colour no longer gets stuck in an inaccessible corner and combined with the wider neck of the pots, this means you can easily reach any colour held in the corners with your brush or palette knife! Galeria enjoys a good to high level of pigmentation, which gives artists from beginner to professional a good correlation to artists' acrylics, making it easier in the transition to artists' grade when a wider choice and even higher pigment strength is needed. During the process of searching for new pigments, suggested colours are made by our chemists and these Leneta cards are just one way we look at the proposals. Galeria also benefits from the improvements we have made to 20 colours, from increased opacity to stronger colour with no change in hue. (See the table below). 076 Burnt Umber Pigment level increased, now stronger with a richer chocolate masstone. 090 Cadmium Oragne Hue Pigment level increased, now more opaque and stronger. Slightly Redder. 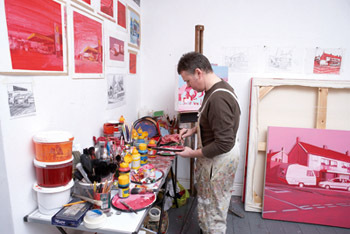 095 Cadmium Red Hue Pigment level increased, now more opaque and stronger. 120 Cadmium Yellow Medium Hue Pigment level increased, now more opaque and stronger. 138 Cerulean Blue Hue Pigment level increased, now stronger. 179 Cobalt Blue Hue Pigment level increased, now more opaque and stronger. 283 Gold Pigment level increased to give a smoother finish and greater sheen. 346 Lemon Yellow Pigment level increased, now more opaque, brighter, cleaner and stronger. 386 Mars Black Pigment level increased, now stronger. 415 Mixing White Removal of zinc oxide from formulation, now no health labelling needed. Clean white for mixing. 483 Permanent Green Light Pigment level increased significantly, now mouch stronger and more opaque. 488 Permanent Magenta Pigment level increased, now more opaque, stronger, brighter and less chalky. 522 Phthalo Green Pigment level increased, now stronger. 533 Process Magenta Pigment level increased, now stronger. 541 Prussian Blue Hue Pigment level increased significantly, now mouch stronger and more opaque. 599 Sap Green Pigment level increased, now stronger. 644 Titanium White Pigment level increased, now stronger, more opaque and cleaner, brighter white. 660 Ultramarine Pigment level increased, now stronger. 706 Winsor Blue Pigment level increased, now stronger. 744 Yellow Ochre Pigment level increased, now stronger. Galeria Acrylic Colours have been chosen to offer a wide and balanced spectrum of bright and vibrant colours, giving the artist excellent choice and the ability to select a palette that best suits their work. Each colour has been specially selected by looking at individual pigment characteristics in both mass and undertone such as hue, colour bias, purity, brightness, transparency, tinting strength and stability. The advantage of Galeria is that the range covers every requirement - from the essential colours for your basic palette, to unique colours not achievable through mixtures, to colours formulated from professional artist grade pigments. Winsor & Newton's objective is to offer the best possible choice of colours to the artist at an affordable price, providing exceptional value for money. The spectrum also includes a number of tints (colour plus white). These ready mixed colours enable the artist to select and apply the colour quickly and easily, without having to worry about consistent colour mixing. Covering power is the ability of a pigment to a) go a long way or b) cover previous layers. This characteristic is a combination of the natural strength of the pigment, the quantity used and its degree of inherent opacity. 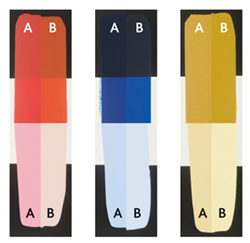 On the Winsor & Newton Colour chart, the transparent colours are marked with or T, the semi-transparent colours are marked or ST. The relatively semiopaque colours are marked with or SO and the opaque colours are marked with or O.Transparency however is relative and the ratings are provided as a guide only. In Galeria there are different degrees of covering power from different colours, as some pigments are naturally more transparent, for example Raw Sienna. This is only right - a range which concentrates on one characteristic above all others would prevent it from being used in other techniques. In this way Galeria is extremely versatile since it offers a sophisticated degree of variation. However Winsor & Newton understands the needs of artists and aims to offer the greatest choice. Therefore Galeria now offers opaque versions of some naturally transparent pigments. Such as Raw Sienna Opaque and Burnt Sienna Opaque. *Opera Rose is a B rating; however it has the highest lightfastness rating within its own pigment category. The unique brightness of this pigment is important despite its B rating.As permanence is especially important in acrylic colour, we ensure all Galeria acrylic colours are rated AA or A (except Opera Rose*), ensuring the whole range is recommended as ‘Permanent for artists' use'. The lightfastness of a paint colour or pigment is how resistant to fading it is, or how unaffected by how light it is. Many ‘student’ or low cost acrylics will often use less permanent pigments, which will fade, sometimes within months. This is particularly notable in the red, yellow and violet area. Galeria does not use any of these less permanent pigments – Galeria uses pure pigments that don’t fade so that your artworks maintain their original colour for decades. Galeria, can be used straight from the tube/ pot or thinned or thickened with a medium or water. This variety in consistency makes Galeria suitable for both oil and water colour techniques. In comparison to oil, acrylics generally have less ‘body'. We've worked hard to achieve a good buttery consistency for quick and easy coverage with Galeria but we've made sure that the brush marks you make stay there. If you start with a very fluid low cost acrylic and you want any brush marks you'll need to buy a medium and spend time mixing it in. Some other brands of acrylic have a thick consistency out of the pot or tube, yet level off on the canvas. During the last decade we've been able to build upon the wider choice of raw materials and produce for Galeria a buttery consistency that will continue to reduce generally as water is added. You can easily experience this by diluting Galeria with a soft brush rather than a bristle brush. 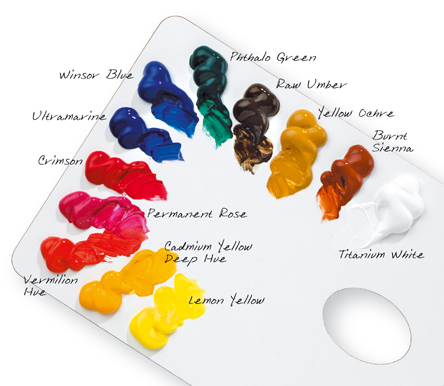 Winsor & newton research has found that most acrylic artists prefer an even satin finish and the improved formulations provide this with excellent depth of colour, makeing colour matching easier from wet to dry. Matt or gloss finsihes can easily be obtained by adding the appropriate Galeria medium. Thin films of colour will dry in 10-20 minutes, thicker films can take an hour or more. Acrylic colour relies upon the variable characteristics of the pigments used in each colour in order to achieve results. Therefore, being able to choose from the widest possible range of pigments means that you have greater choice and flexibility to develop your work and technique. Upgrading to Winsor & Newton Professional Acrylic Colour range means that you will have a much wider and balanced spectrum of colours to choose from, giving you the widest choice of pigments as well as unparalleled brilliance of colour. Acrylic paints can produce wonderfully colour-rich artwork as well as stunning texture and bring unrivalled depth to a piece. Galeria is such a comprehensive range that it is ideal for all your fine art requirements. The spectrum, pigment choice, pigment strength and opacity of the range will ensure you succeed, and get the results you want. This means there is no restriction to your talent, whatever your style. As Galeria is an economical medium it is ideal for use on large-scale works such as scenery, theatre sets or murals. With its fast drying time, Galeria is suitable for works indoors and outdoors. Preparation - Unless new, the wall is best stripped back to plaster and must not be dusty, have a broken surface or damp. Oil based paint layers should be removed. If new, plaster should be allowed to dry, sized with wallpaper paste and then primed with Acrylic Gesso Primer or Galeria White Gesso Primer. If stripped and the wall proves dusty or to be friable, a suitable stabilising primer should be used, before applying the Winsor & Newton primer. Drying time & Protection - Colours will be touch dry in approximately 20 minutes. Allow the completed work to dry for 48 hours before varnishing. For interior murals, which are thought of as fine art, Galeria Gloss or Matt Varnish is recommended. For exterior work, an exterior quality polyurethane varnish provides greater protection. With the ability to use colour straight from the tube and with the benefits that acrylic offers in terms of fast drying properties, this makes painting with acrylic quick and easy and ideal for creating home interior ideas to suit your needs. Why not add an individual and personal touch to your rooms by creating something that you will be proud of. Sometimes the simplest creations are often the most effective. You could try painting three 30 x 30cm canvases a solid colour, each a slightly different shade of one colour or the colours to match your room setting. 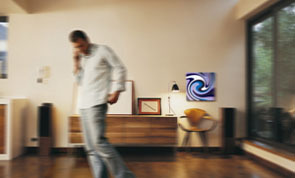 Hang the three canvases horizontally on a wall about 10cm apart to produce an abstract triptych. 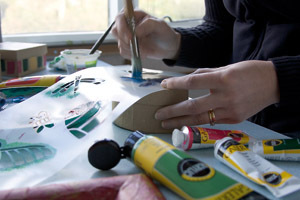 Acrylics can be used for craft creations to suit any home interior and offer unlimited creative possibilities. Galeria offers a bright spectrum of colours and with their quick drying properties your craft activities will not take you long. Try adding dried flowers, dried pasta or simply add some of the Galeria texture gels to produce a 3 – dimensional masterpiece. For other ideas, why not try making home made greetings cards or simply take a piece of canvas and add colour and accessories as you desire. Get creative and bring your ideas to life! Painting is often as much about texture and “feel” as it is about the “look” of the image and that’s why we have developed a complementary range of Galeria Acrylic Mediums that are perfectly suited for Winsor & Newton acrylic colour. Designed to offer you fresh options, these allow the artist to explore the full range of the tactile as well as visual properties of acrylics. Acrylics allow you to explore virtually any application you can imagine. The possibilities range from controlling the finish (be it gloss, matt, satin or iridescent) to altering the consistency of the colour (thick for textured works, thin for flat paint films). Using the proper medium allows for staining, printmaking, mixed media, aggregate textures and even carving. Visit our Acrylic Mediums section for more information on all the different mediums offered. Your initial palette should provide a wide colour spectrum and should have a good balance between strong tinting and weaker tinting colours. 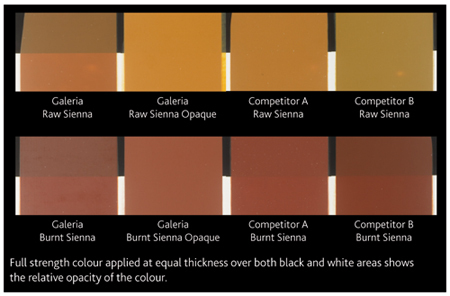 The common practice is to maintain a broad palette of about twelve colours and add to it for specific requirements.